She graduated in Rome with Giulio Carlo Argan and got the Master of Fine Arts degree from the State University of New York at Binghamton . In 1974 she won a public competition at the Ministry of Cultural Heritage and is assigned to the Central Institute for Restoration in Rome. There she has taught Theory of Restoration and Art History for ” Conservators – Restorers ‘ courses “. During her tenure in the ICR she has been the creator and coordinator of several conservation and restoration projects, such as Raphael in the Loggia of Psyche at the Foreign Ministry , and the opening of Emperor Frederick II’s Sarcophagus n the Palermo Cathedral. She was in charge at the Laboratory of textiles and has taught Art History , History and Theory of Restoration . She has taught at the University of Tuscia for six years firstly History of Applied Arts and then History of Restoration. In 2002 she was ordered at ICCROM (International Centre for the Study of the Preservation and Restoration of Cultural Property) where she held the position of Senior Program Coordinator , specifically focusing on courses concerning ” Sharing Conservation Decisions”. She has worked to the forums Living Religious Heritage – Conserving the Sacred ” ( Rome ) and ” Privatization and Cultural Heritage ” (Catania). She was representative of ICCROM at meetings , conferences, committees and missions of technical nature . Her tenure has focused on identification and development of highest methods and means for a continuous research on conservation worldwide. She has been responsible for contacts between those institutions who were interested in conservation, universities and official bodies for Conservation, both for Italy and other countries. 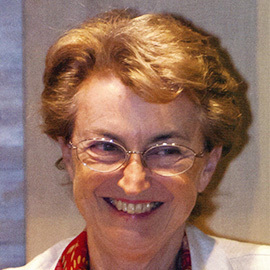 She has held management positions at the ICOM- Conservation Committee , ICOM- Italy and CIETA (Centre International d’ Etude des Textiles Anciens) . She has held conferences and published articles ​​about history and theory of restoration in various languages. She is currently Special Adviser to the General Director of ICCROM.